July | 2014 | Franchising You. 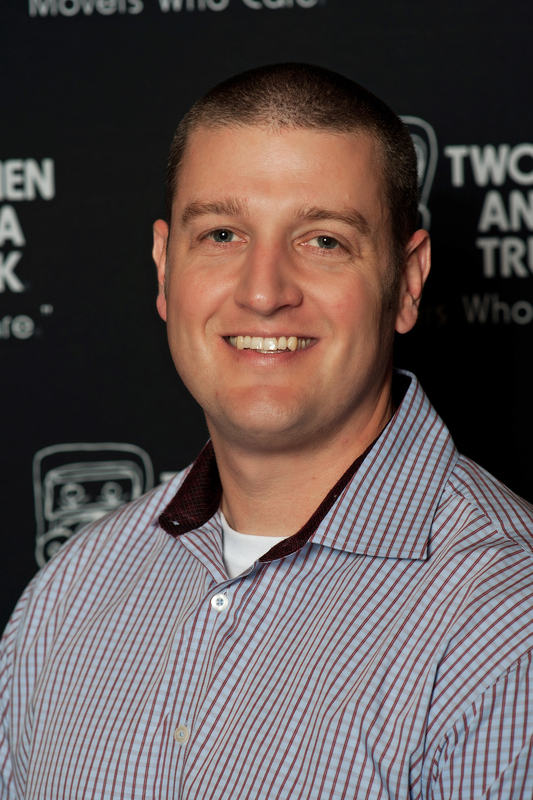 Meet Bert Kolz, president of Black Wolf Group and overseer for eight TWO MEN AND A TRUCK® franchises across three states. Having a diverse professional background prior to joining TWO MEN AND A TRUCK® has been integral to Bert’s successful transition into his role as president of Black Wolf Group. After working in corporate America for 25 years and gaining experience in finance, marketing, and general business, Bert began working for the Black Wolf Group, a private firm which owns several TWO MEN AND A TRUCK® franchises. 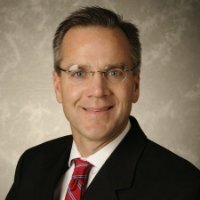 He has worked for well-known companies such as Arthur Anderson, Rust-Oleum, Ben Franklin Retail Stores, Lands’ End, and Grainger. TWO MEN AND A TRUCK® caught Bert’s attention when he learned the company is an industry leader and the Core Values closely match his own. Successful businesses or, in this case, franchises, often have recipes for success or key factors which come into play. To run a successful operating unit Bert’s philosophy is simple: hire good people; provide superior customer service; and utilize the tremendous amount of resources already available within the franchise system. Many franchises have defining moments within their history which led to their success. This defining moment isn’t really a “moment” for Bert, but instead a defining attitude. He describes this attitude as his franchisees’ willingness to accept the risk of expansion, embrace change, and accept the TWO MEN AND A TRUCK® vision. This defining attitude has proved to be an excellent contribution for Bert and his team. Black Wolf Group has seven general managers running his franchise territories and all of them started as movers and drivers for TWO MEN AND A TRUCK®. Black Wolf Group currently owns 11 TWO MEN AND A TRUCK® franchises. Within the next five years, Burt and his team hope to maintain double-digit sales growth at each of their TWO MEN AND A TRUCK® locations, adding both trucks and jobs to the system while taking market share from competitors. Which is certainly attainable for the group! The TWO MEN AND A TRUCK® brand is passionately dedicated to the satisfaction of its customers. Many companies can make this claim, but somehow in the day-to-day running of the business, this focus becomes trumped by financial and employee concerns. As a franchisor, an additional layer exists between the brand and the customer at the level of our franchisee partners and their team members. But we continue to achieve a 96 percent or higher customer referral rating and 59 consecutive months of revenue growth. So, we assert to know a little something about the art of satisfaction! Here are three tips we can offer. Tip #1: Walk the walk. Stop with the talk. If you are just talking about customer satisfaction when there is a problem or when your results are positive, and you justify dismissing the subject, then assume your customers are not being satisfied to the level required. Also, just talking versus taking action serves no purpose. Customer satisfaction must be a part of any and every business discussion you have, from the numbers to your team. At TWO MEN AND A TRUCK®, we have a basic rule for any change, project, or investment we undertake. We start by asking “What does this do for the customer?” Our franchisees are not our customers. They are our partners. So we listen to their experience in the field with move customers to shape what we do at Home Office. Sometimes change can be tough, and customer expectations are constantly evolving which drives further change. However, when we have all agreed to focus on the customer, this brand has accomplished amazing growth while maintaining high levels of customer satisfaction – not an easy feat. Tip #2: Treat everyone like Grandma. The Grandma Rule® is a fundamental Core Value for this company. Grandma Eb was part of the foundation-building of this business nearly three decades ago. The family ran the business from her farm in the beginning. She was equal parts feisty and loving, somebody you would treat with dignity and respect. The Grandma Rule® is a simple rule, clear enough to teach and follow. From our CEO to franchisees to our movers, we learn it and practice it with fervor. This does not mean mistakes are not made, but we look to apply that same principle of dignity and respect when resolving both internal and external challenges. When you start to trade profit for Grandma, that’s when you will find your company in an unsustainable situation. Tip #3: Together we create a culture of happy. We have more than 300 locations as of June, now servicing customers across the United States, Canada, the United Kingdom, and Ireland. There are over 200 franchisees acting as leaders of these locations on a day-to-day basis. At the peak of our season, there more than 7,500 employees servicing our customers. As partners, we need to make sure we understand each other, and this means having honest conversations about whether we are satisfied in the relationship. As a brand, we have chosen to independently survey our franchisees through the Franchise Business Review. This year we ranked in the Top 50 for the ninth year in a row. Ninety-nine percent of our franchisees would recommend us as a business opportunity to others. 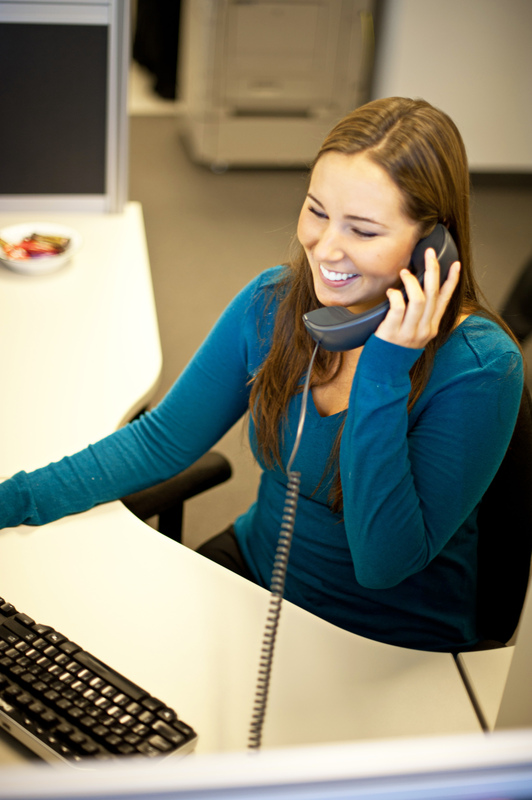 They have a tough job of managing the teams who interact on the frontline with the customers. This is so important to the brand! In addition, we have created a culture where if you exceed customer expectations, you can go from a mover to a franchisee. Being the best you can be with the customer can move you forward to new opportunities. Yes, there are some days where our team members in the system are not satisfied or struggle with change. In these moments, we work hard to have the tough conversations, and we remind ourselves at the corporate and franchise level we are not the most important people. Our customers are the most important people, and that is the point where true alignment is realized. The conversation then pivots and common ground is then leveraged. If we do more than right by them, then we will all be happier, healthier, and more satisfied from a success standpoint. By focusing on the satisfaction of your customers first, you are building satisfaction for all team members of the company and the brand. Happy people produce more happy people, and no brand can really thrive without happy customers. It’s basic math not hard to calculate by adhering to the basic tenets. 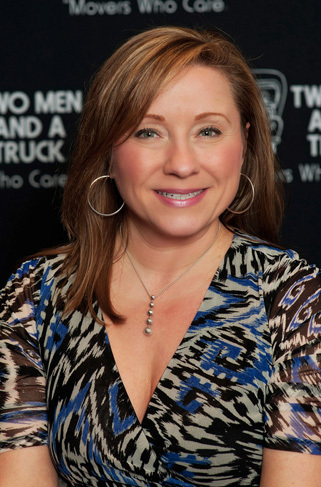 Lana Adam, Sales Director at TWO MEN AND A TRUCK®/INTERNATIONAL, Inc. In my 25 or so years of selling everything from chicken to virtual offices, I can tell you firsthand that sales sounds simple but it certainly isn’t easy. Sales people in general are often viewed with skepticism, expected to be outgoing and gregarious, and have an amazing resiliency for dealing with rejection while pursuing their next sale and chasing ever-increasing goals. If that description doesn’t have you scrambling to update your resume for landing the next open sales position you can find, here is a better description of sales which may provide more accurate insight: sales is the art of helping people solve problems. At TWO MEN AND A TRUCK®, we happen to help people solve one of life’s more stressful challenges — moving their entire life from point A to point B without delay, damage, or loss. When executed correctly, at the heart of every good sales process lies an unrelenting desire to help people; at the heart of every great sales process is the unrelenting desire to help people while adhering to a strong moral and ethical code. We call them our Core Values. Virtually everyone has a moving horror story or knows someone who does. Strong belief in our Core Values – integrity, giving back to the community, The Grandma Rule®, caring, and to be our best and have fun – provides our sales professionals the framework to offer customers a professional and pleasant moving experience that will meet or exceed their expectations. In an extraordinarily competitive environment fraught with moving providers who engage in questionable practices, chief among our Core Values is integrity. Providing customers with the most accurate moving estimate possible is important for a number of reasons: overestimate and we run the risk of compelling customers to consider seemingly less expensive options; underestimate and customers may find themselves unpleasantly surprised with the total at the end of their move. No one, and I mean no one, likes that kind of surprise. 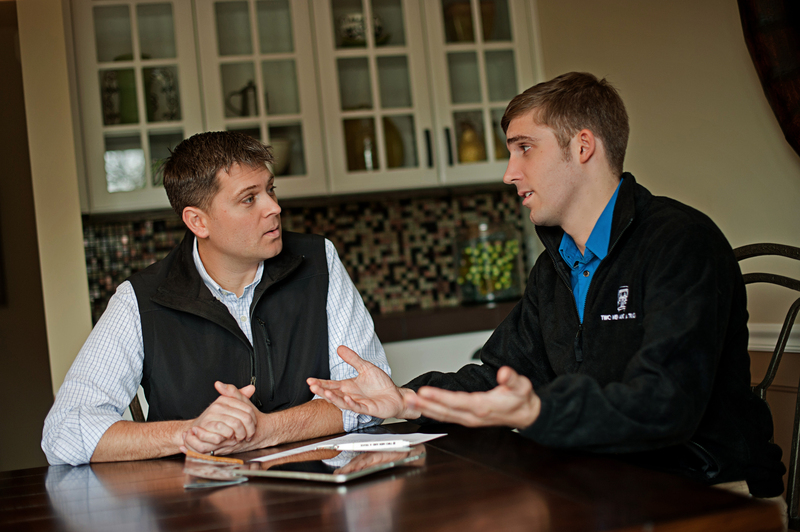 Our move consultants are trained to ask specific questions regarding each customer’s unique move to help develop the most accurate estimate possible. Our 96 percent customer satisfaction rating indicates we’re getting it right. Going hand-in-hand with integrity is The Grandma Rule® where we strive to treat each customer as if they were our own grandmother. You’d probably want your grandmother and her belongings treated with the utmost respect, right? We strive to do that every day, beginning with the very first interaction with our move consultants whether online or by phone. Caring for our customers doesn’t stop once our team has booked your move. In fact, it’s really just the beginning. Our move consultants, movers, and drivers work to ensure you have everything you need to protect your treasured belongings during your move. They’re trained to consult with customers, learn about what types of items are being moved, and help assess your needs for packing and unpacking assistance, and recommend necessary moving supplies ranging from boxes to bubble wrap. We challenge our teams to be their best and have fun every single day and just because you’re moving, doesn’t mean you can’t have a little fun along the way. While it may not be the same kind of fun as, say, a day at the beach, we try do whatever we can to help you begin your new adventure on a high note. Four of these Core Values – integrity, The Grandma Rule®, caring, and the opportunity to be our best and have fun – support our ability to give back to our communities. 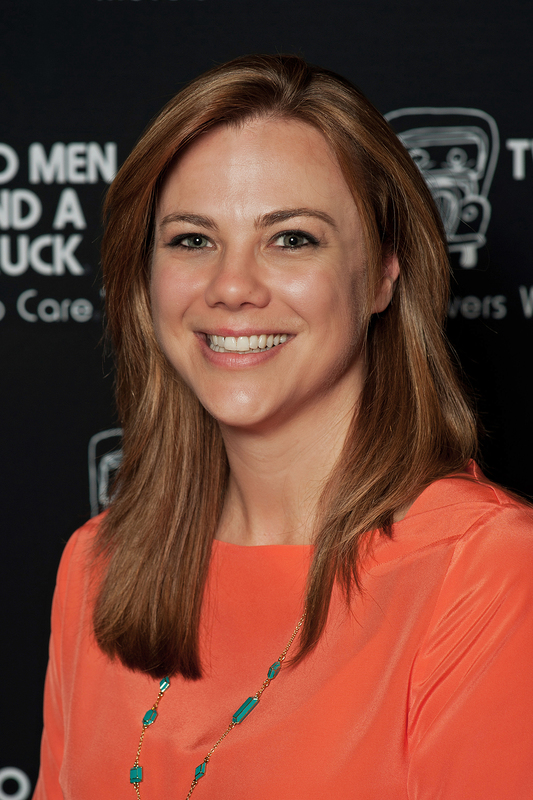 Beginning with Mary Ellen Sheets’ first $1,000 donation to 10 different community charities, our sales team is at the leading edge of helping customers understand the unique benefits of using TWO MEN AND A TRUCK® over other moving options. That in turn enables us to help those in need move forward in their lives, too. In the spirit of helping people move forward, our corporate sales department strives to support the on-going growth and success of our franchisees and their sales teams. We host quarterly peer sessions so move consultants can brainstorm and network with their peers around the world to share best practices on relevant performance topics like building rapport with customers, communicating the value of our services, and helping customers assess their needs for boxes, packing supplies, or packing and unpacking services. A training program is offered to help even those team members with no prior sales experience gain the skills and master the concepts to help customers solve their moving problems and choose TWO MEN AND A TRUCK®. Our Core Values make our sales process not just a systemized series of questions but, rather, transforms it into personal interactions and opportunities that help people solve problems. It’s one of the most rewarding and fulfilling sales roles I’ve ever had and THAT is something that should have you scrambling to update your resume! One of the biggest career decisions a person can make is to become a small business owner. In fact, it isn’t simply a career decision but a major life decision. With so much preparation, research, time, and money invested to make the giant leap, the risk is too great for many would-be entrepreneurs. Now, imagine making the commitment to dive into the world of business ownership…with your spouse. Talk about a list of pros and cons! 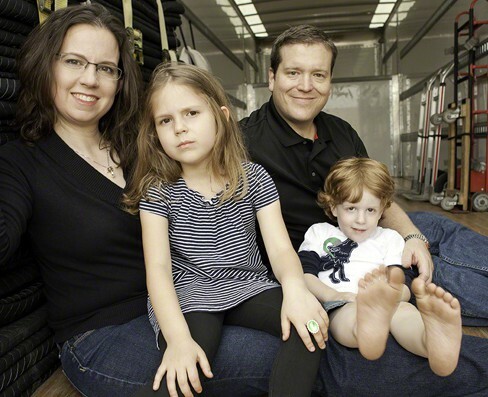 We caught up with some successful TWO MEN AND A TRUCK® franchisee couples to learn the secrets of business – and marital bliss. Franchisees Brooke and Les Wilson have been running successful franchises and growing their business portfolio for 10 years. They now operate nine offices across Maryland, DC, North Carolina, and Georgia. In addition to defining roles and responsibilities, they had to learn to leave work at work and dedicate personal time outside of work. In marriages where a joint business venture does not exist, couples come home after a long work day and vent to their spouse; however, a business partnership impacts a personal connection to the venting and fuels more than often intended. Building business together for both couples has also afforded unexpected rewards. They have learned to harness individual strengths and build business roles around those skills – and ultimately learning more about one another than imagined. Additionally, there is no boss from whom to request time off, so when it is time to enjoy some much-deserved vacation time, they plan to have the day-to-day operations of the business handled while appreciating time away. 1. What are your individual strengths and weaknesses, and how will that play into your work roles? Set yourselves up for success by honestly putting your weaknesses on the table and build your individual business roles and responsibilities based on your core strengths. This isn’t easy or fun, but the exercise is worth the investment. The more outgoing partner is going to be bitter if stuck inside four walls crunching numbers all day. 2. How do you divide the work at home, and will those roles change? It is easy to imagine how life will be once you are running a business together, but reality can be altogether different. There are still responsibilities at home; the trash needs taken out, groceries need bought, and kids need baths. It is helpful to have a plan, even in writing, dividing the work at home, as well as the office. 3. What are your expectations for how you will interact with each other and your employees? Determining how both partners can earn respect from employees while maximizing influence is important to think about. Do you want to be called by your first name as opposed to informal, affectionate names used at home? Team members may find it hard to take the business owner seriously when always being called “sugar bear” by their spouse. Learn more about the Wilsons here. And read the Shunk’s full story here. 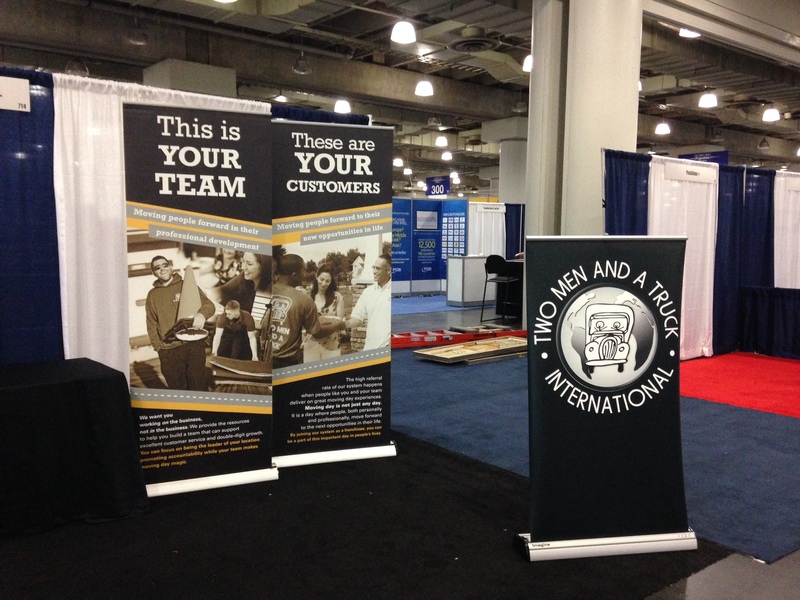 Recently our Franchise Development Director Kelly Rogers, and Franchise Developer Noelle Burak represented the TWO MEN AND A TRUCK® brand among more than 450 top franchises at the International Franchise Expo in New York City. There they shared information about TWO MEN AND A TRUCK®’s rapid growth and current franchising opportunities. 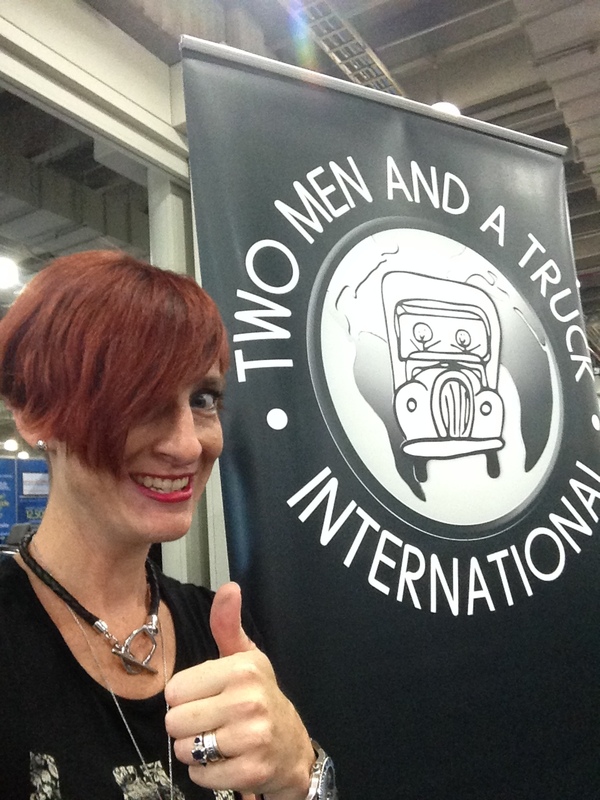 The expo was an excellent time for business-savvy individuals to learn more about the TWO MEN AND A TRUCK® brand and the opportunities that arise from being a TWO MEN AND A TRUCK® franchisee. 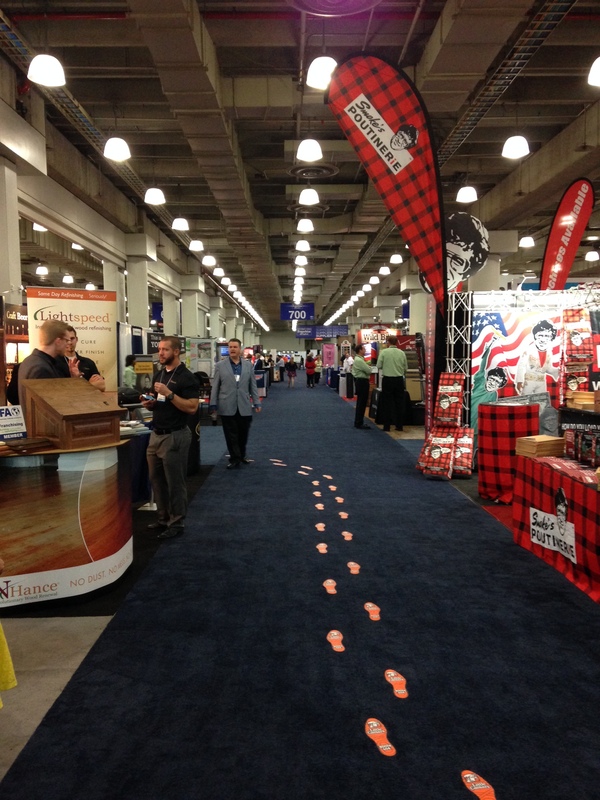 Here are some fun behind-scenes-photos from the expo.